Learn about plants that make great thrillers in combination planters. Here are a few ideas for some specific needs. Everyone is always looking for annuals for shade and for height. And don't forget to plant something that smells good close to your seating area or close to your door. Learn how to prune shrubs. Click here for part 2, When to Prune. 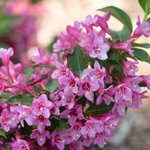 Pruning Shrubs, Part 2 - When is the Best Time to Prune? Learn about drought tolerant perennials. New plants are the life's blood of any plant company and our outstanding new varieties are sure to find homes in your garden. With the right sun, water, fertilizer and a bit of care you can grow truly super Superbells®.